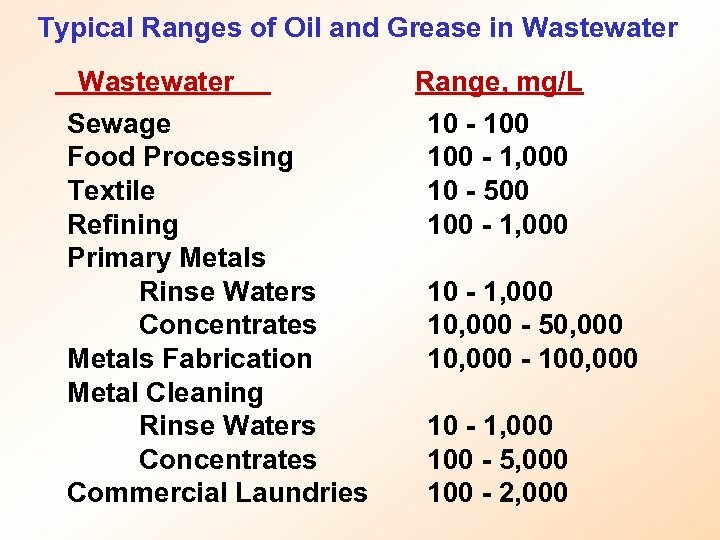 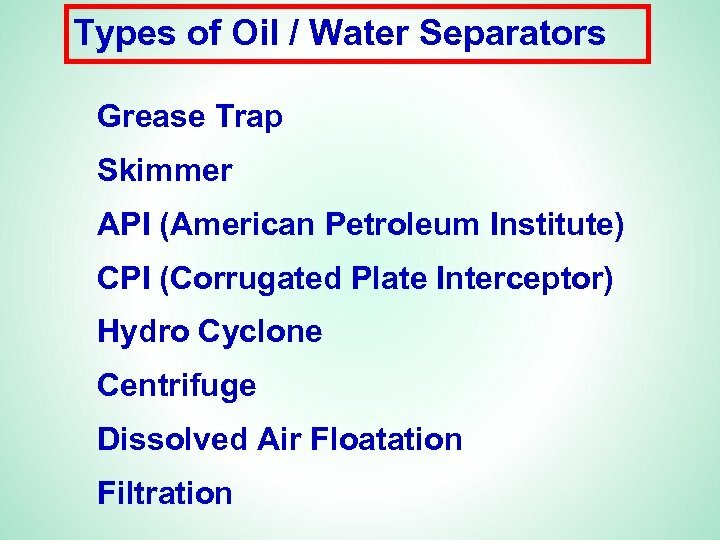 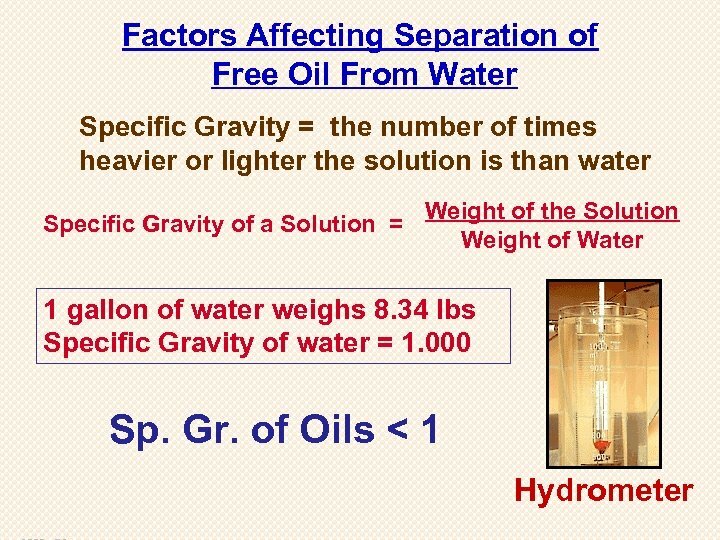 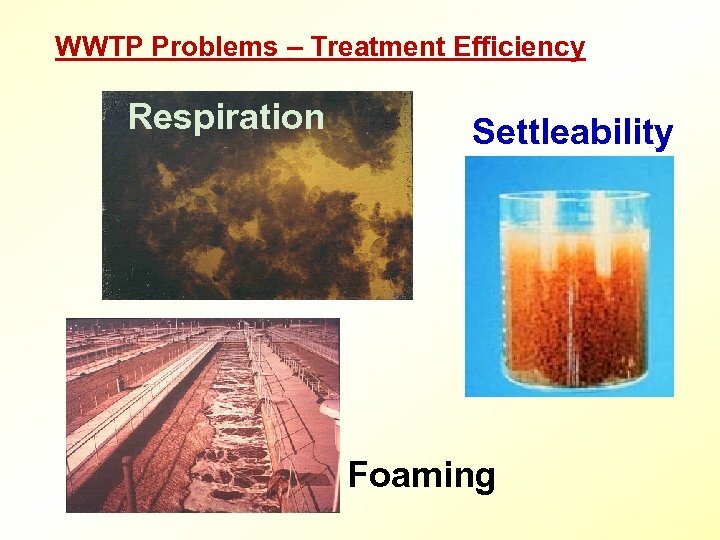 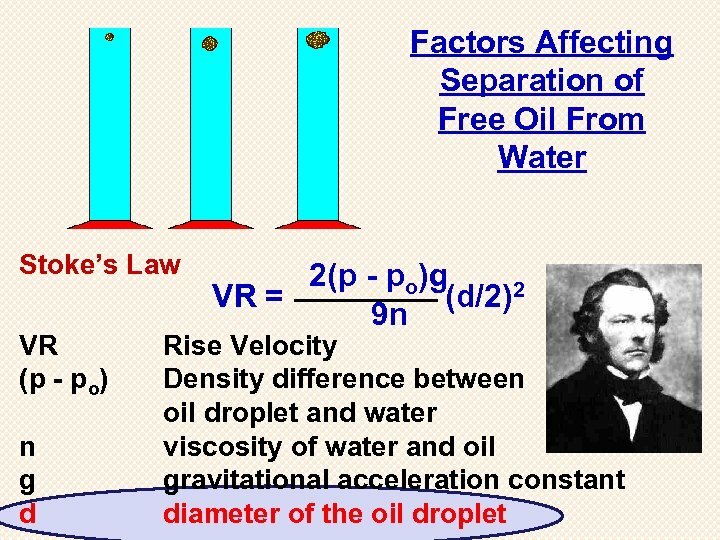 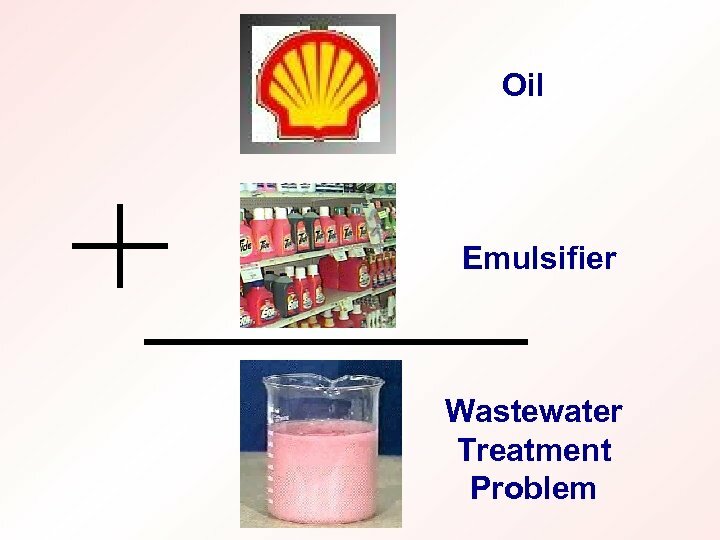 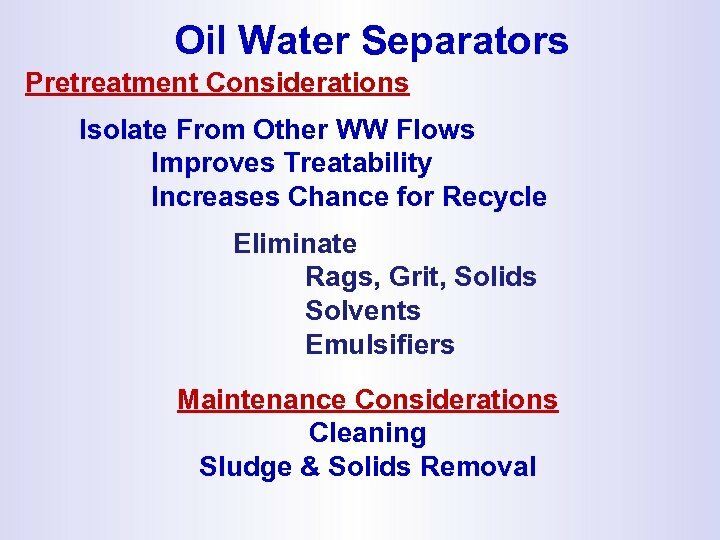 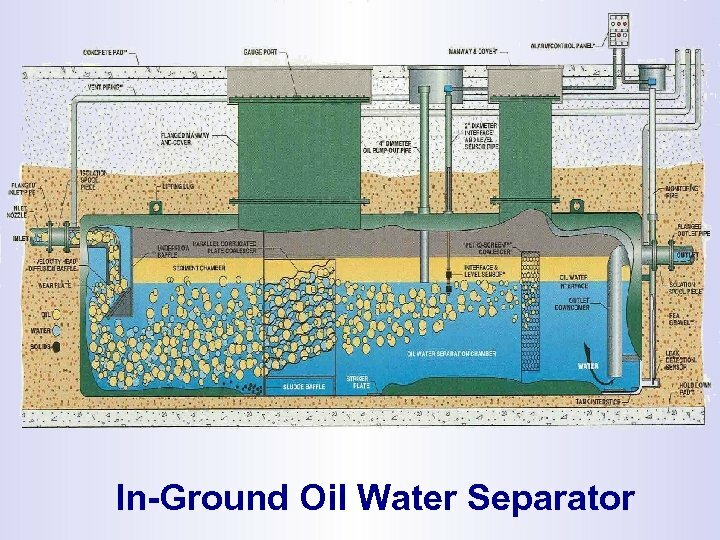 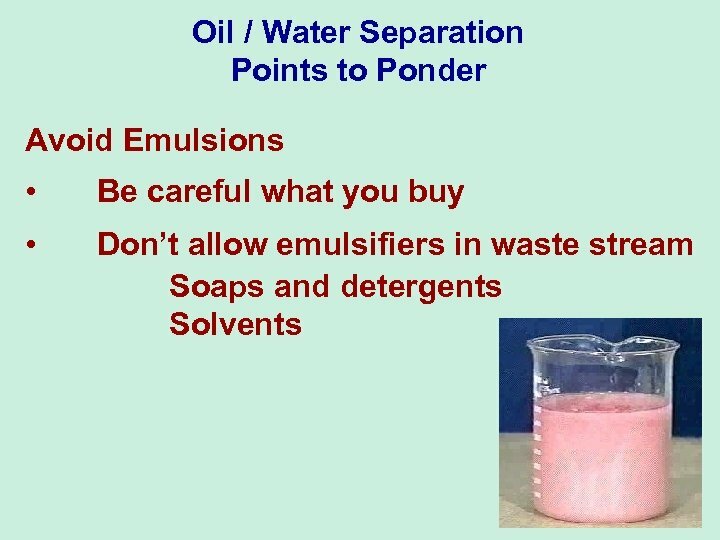 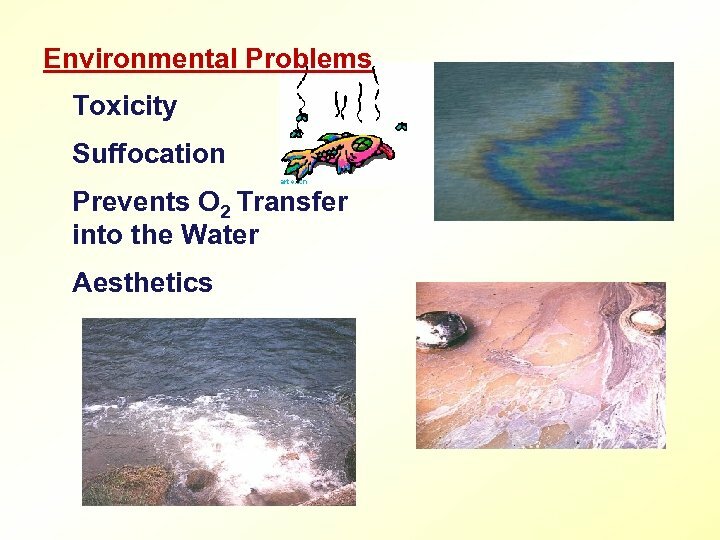 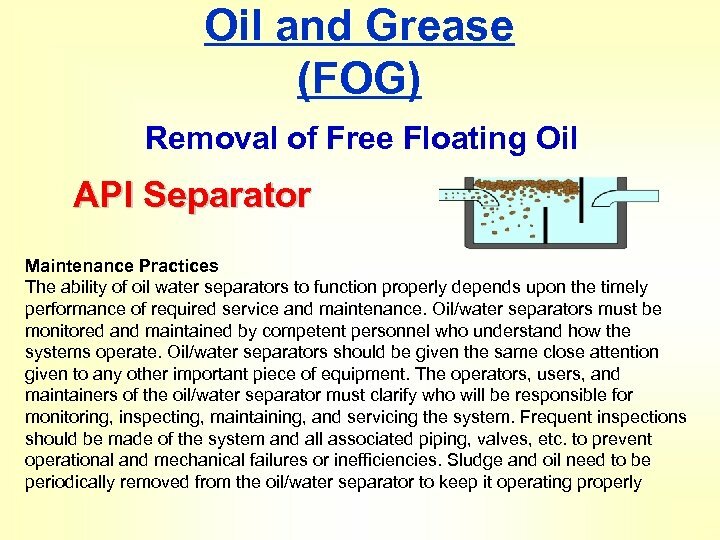 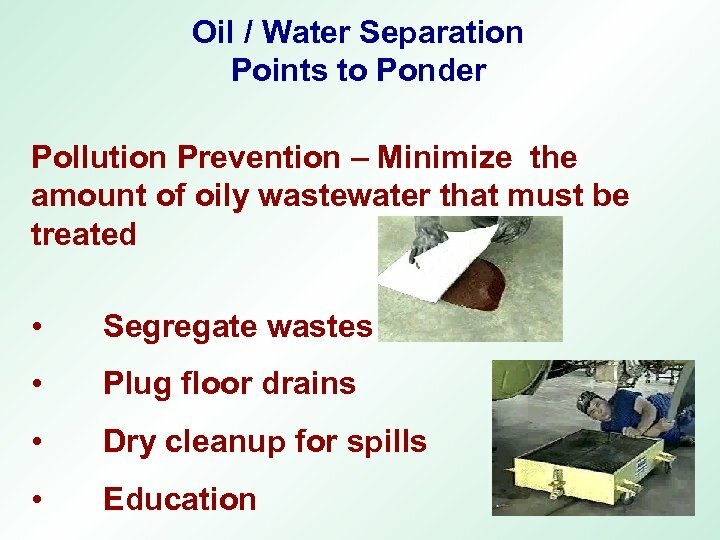 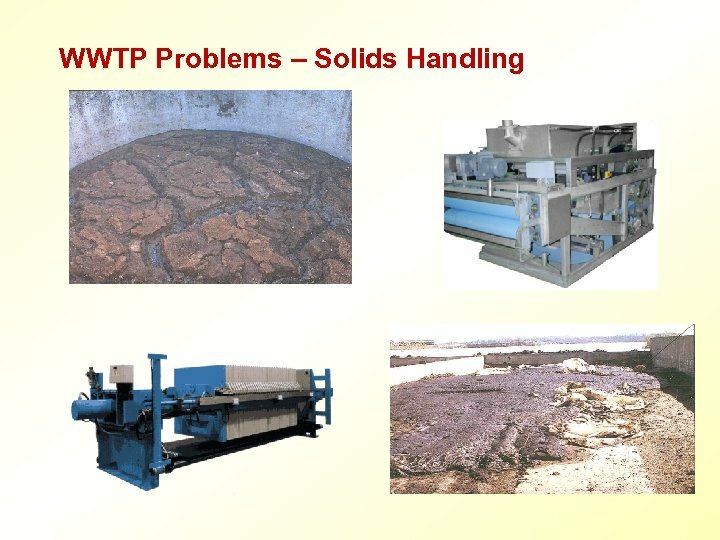 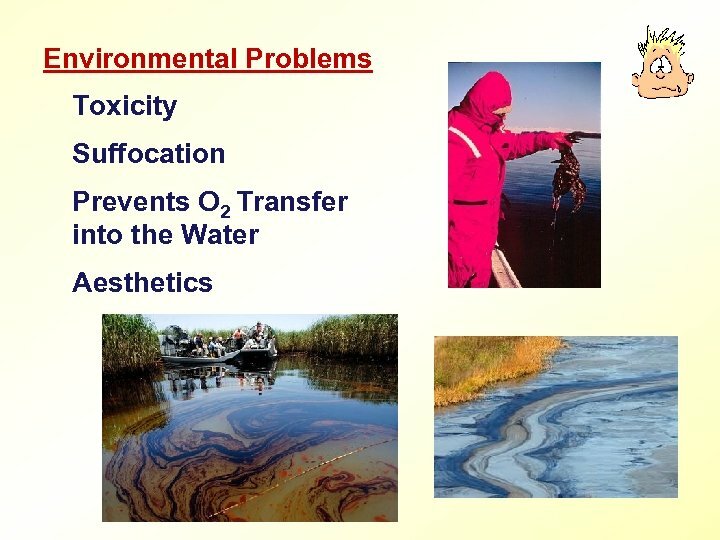 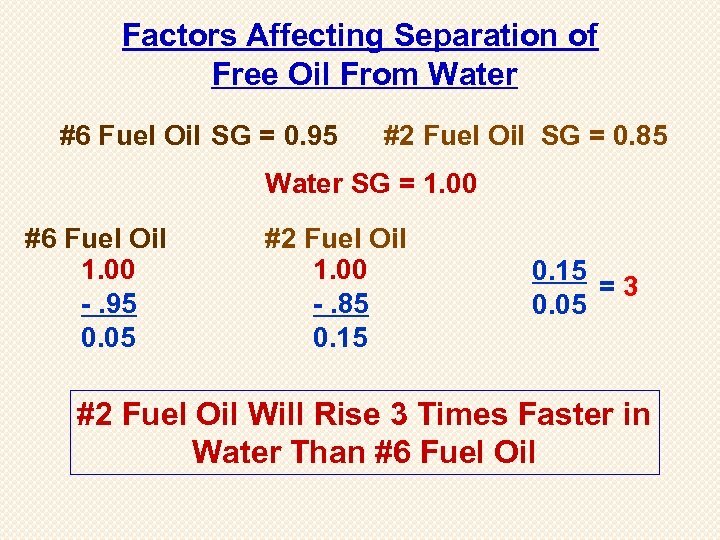 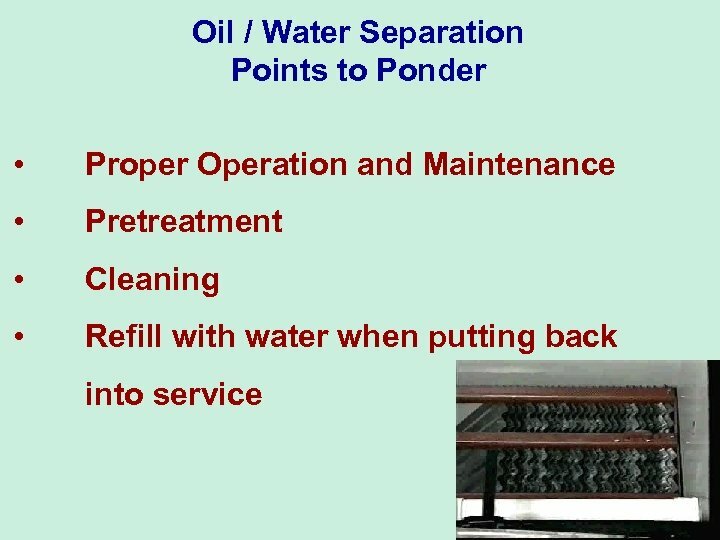 Factors Affecting Separation of Free Oil From Water #6 Fuel Oil SG = 0. 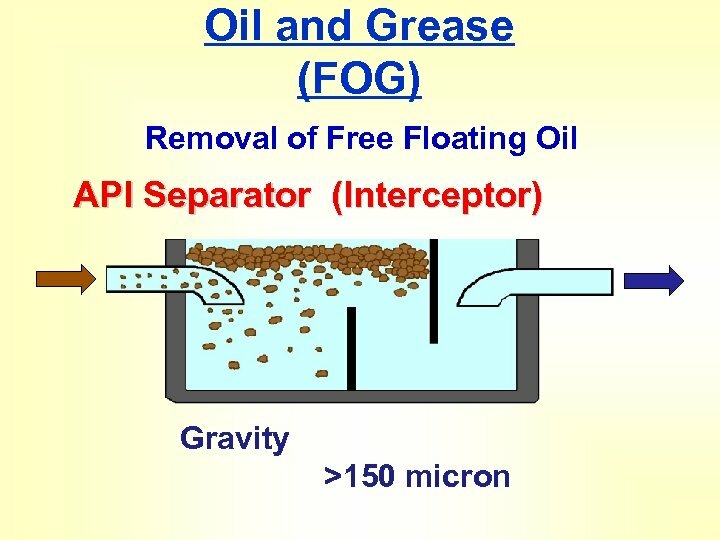 95 #2 Fuel Oil SG = 0. 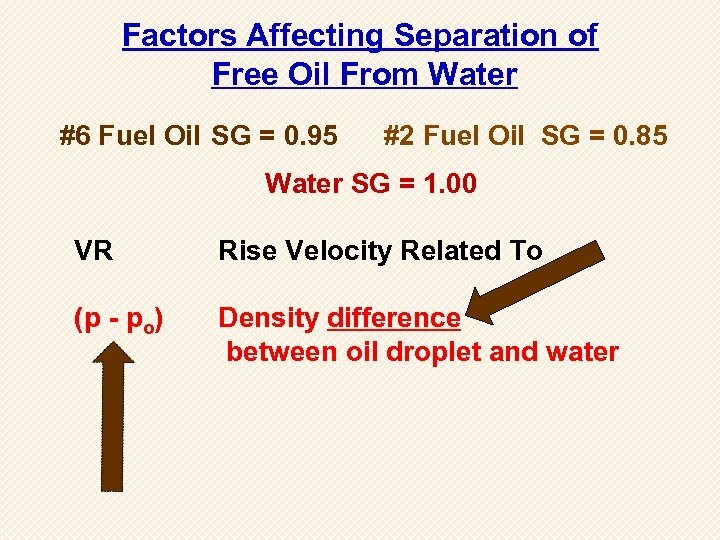 85 Water SG = 1. 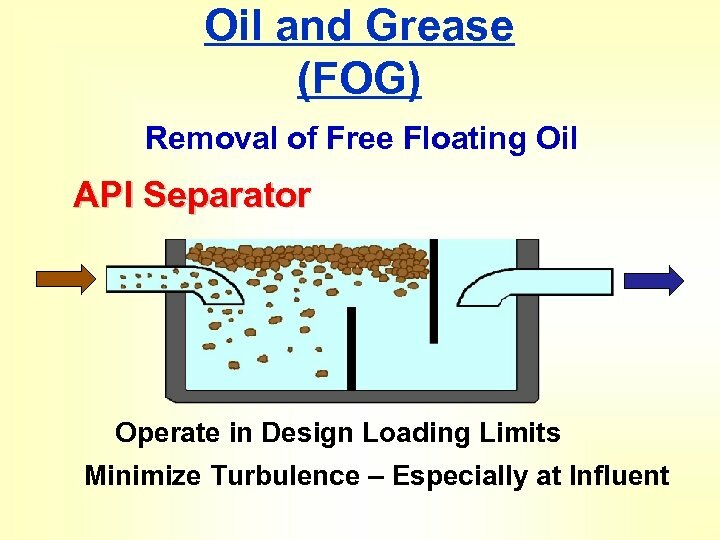 00 #6 Fuel Oil 1. 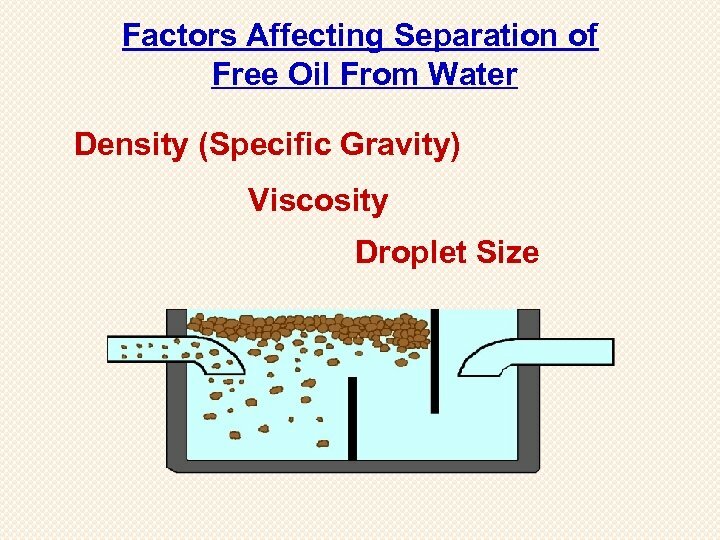 00 -. 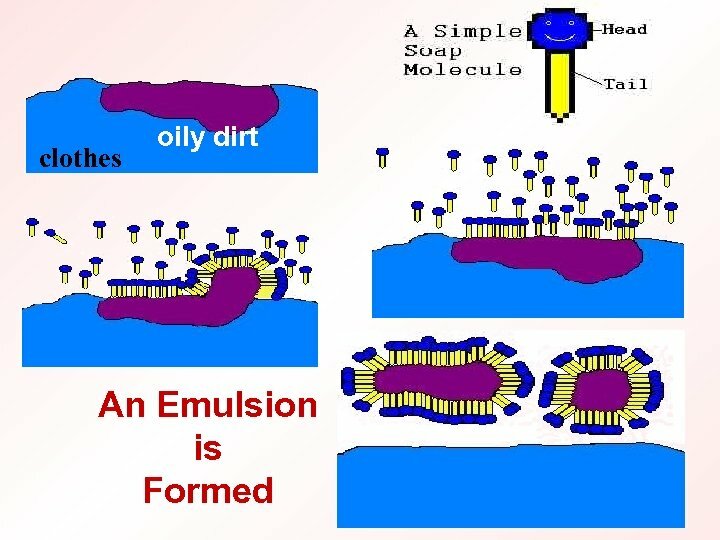 95 0. 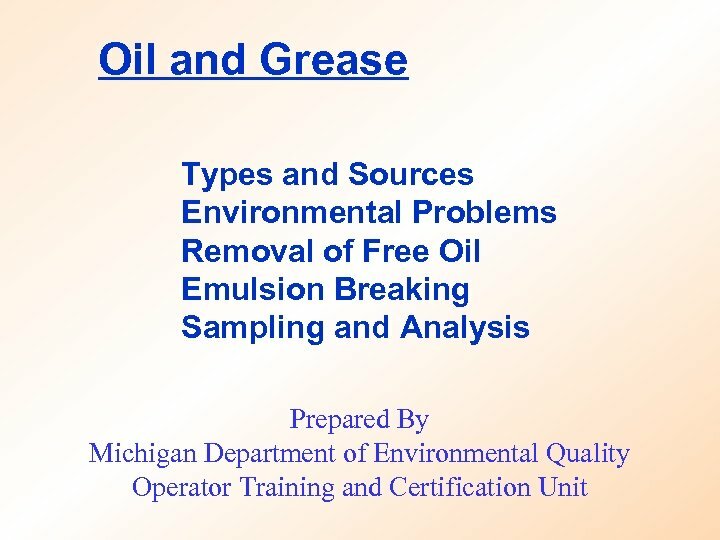 05 #2 Fuel Oil 1. 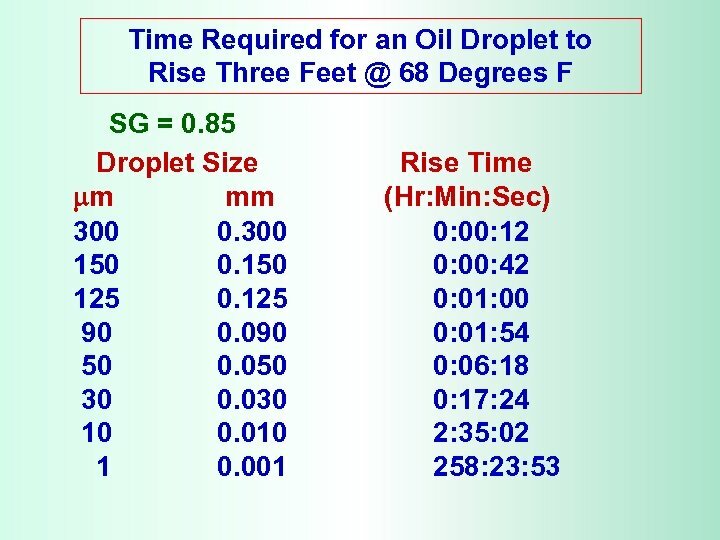 00 -. 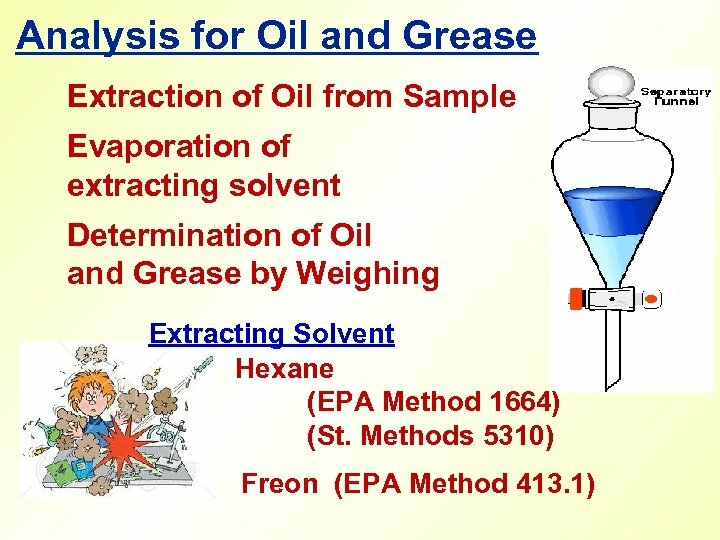 85 0. 15 Which Will Rise Faster? 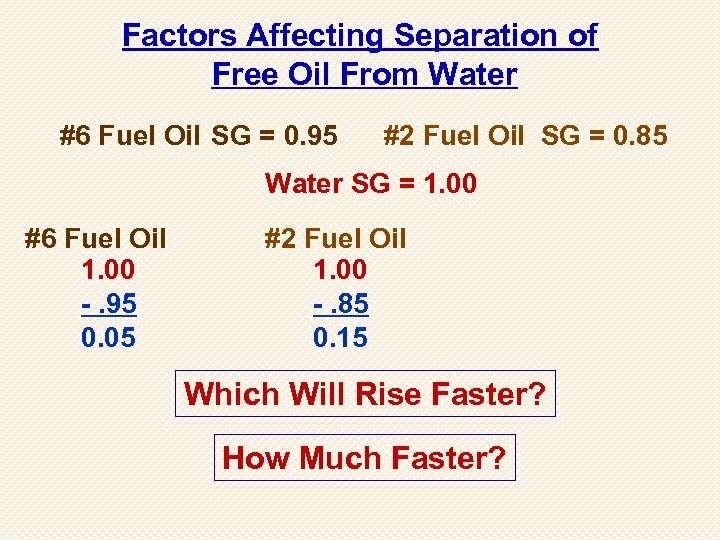 How Much Faster? 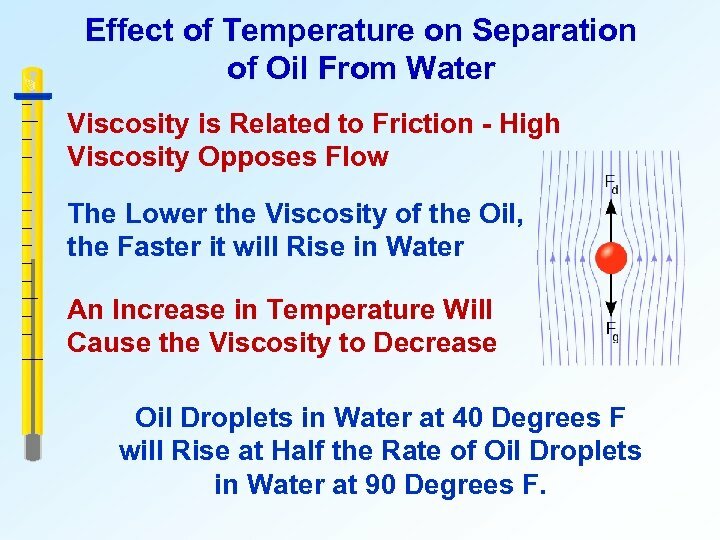 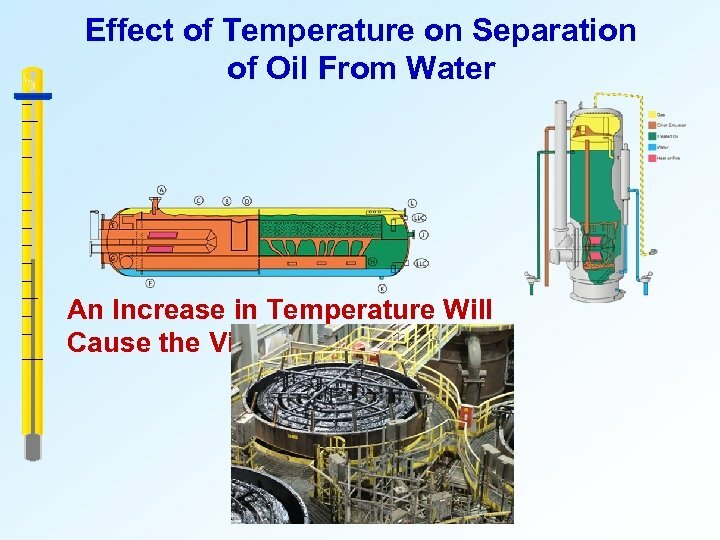 Effect of Temperature on Separation of Oil From Water Viscosity is Related to Friction - High Viscosity Opposes Flow The Lower the Viscosity of the Oil, the Faster it will Rise in Water An Increase in Temperature Will Cause the Viscosity to Decrease Oil Droplets in Water at 40 Degrees F will Rise at Half the Rate of Oil Droplets in Water at 90 Degrees F.
Oil and Grease (FOG) Removal of Free Floating Oil API Separator Oil/water separators must be monitored and maintained. 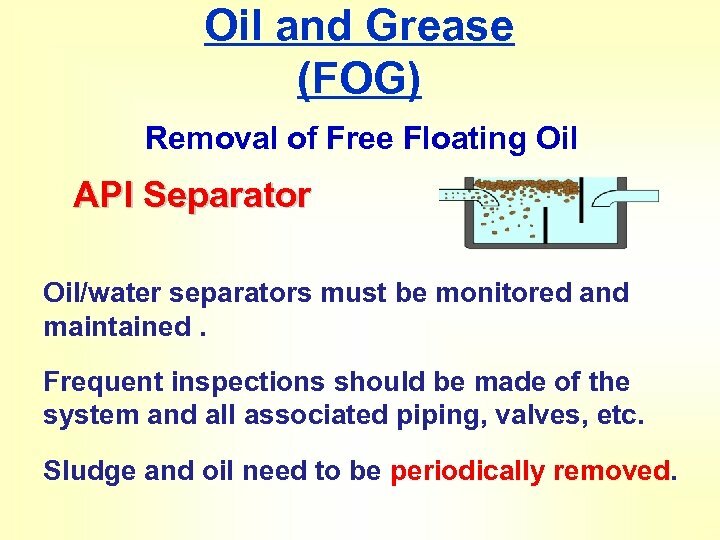 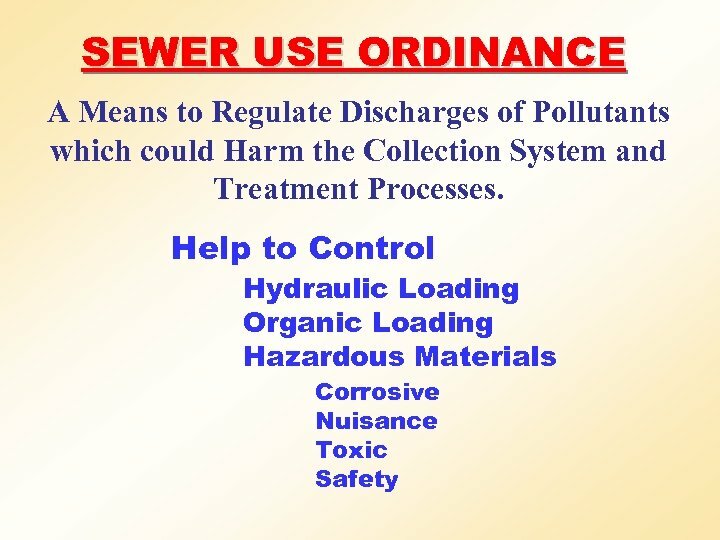 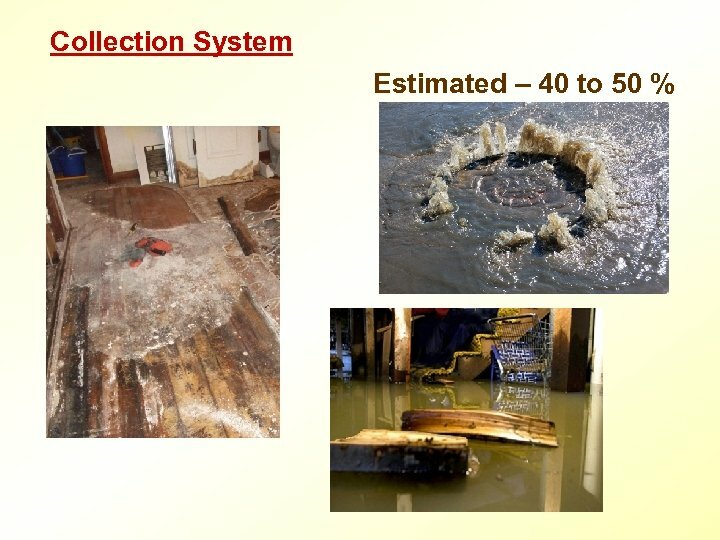 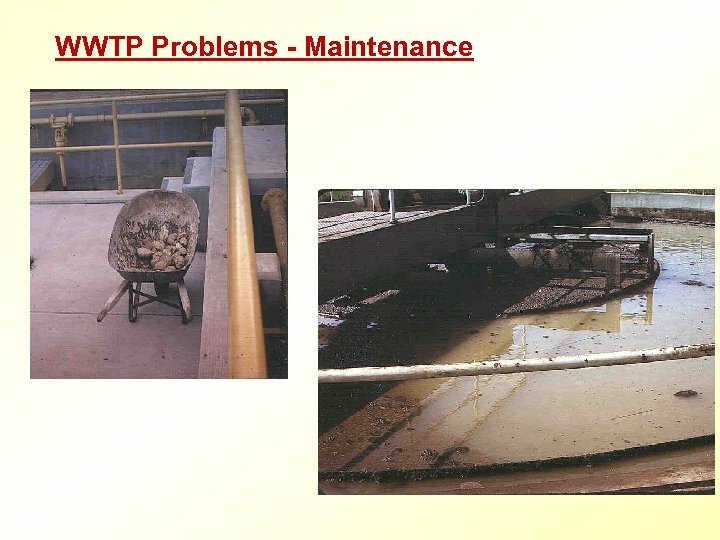 Frequent inspections should be made of the system and all associated piping, valves, etc. 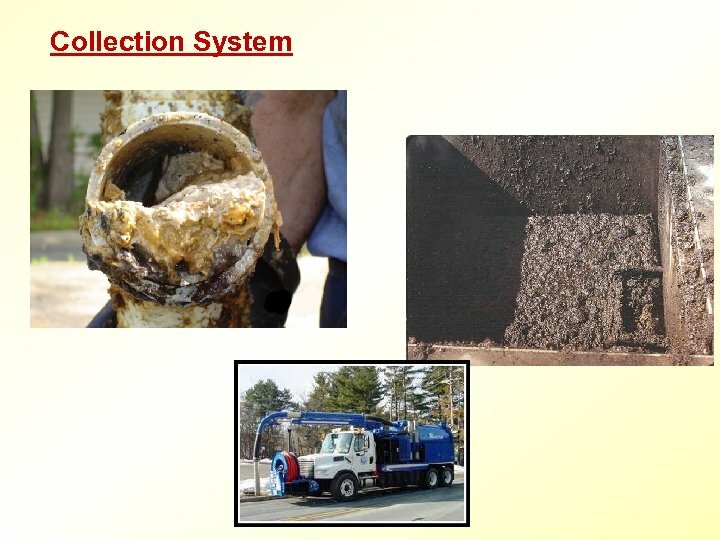 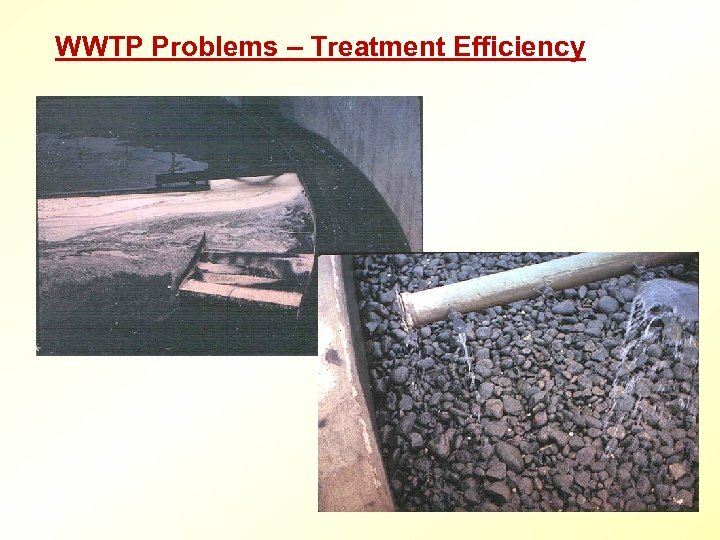 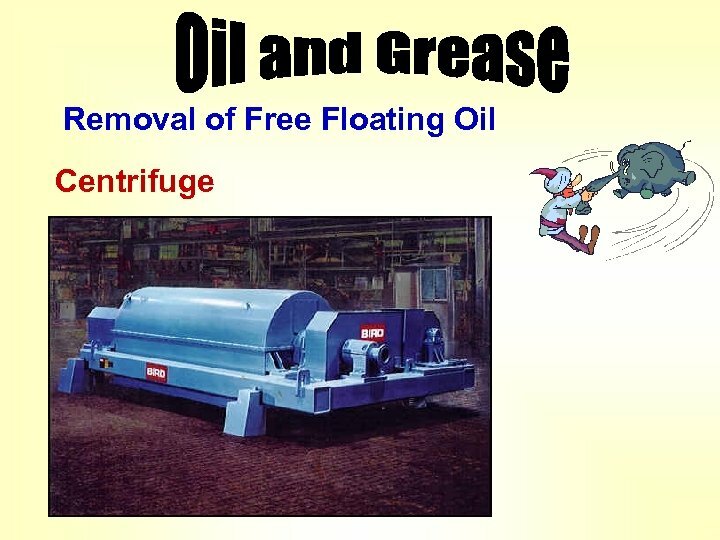 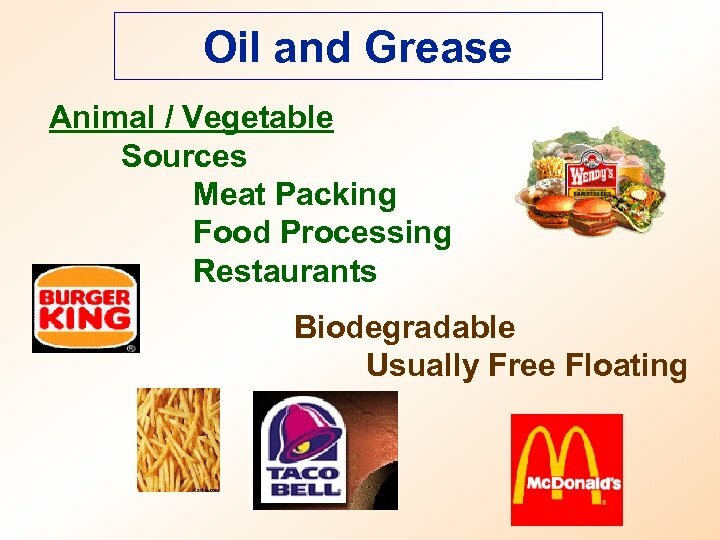 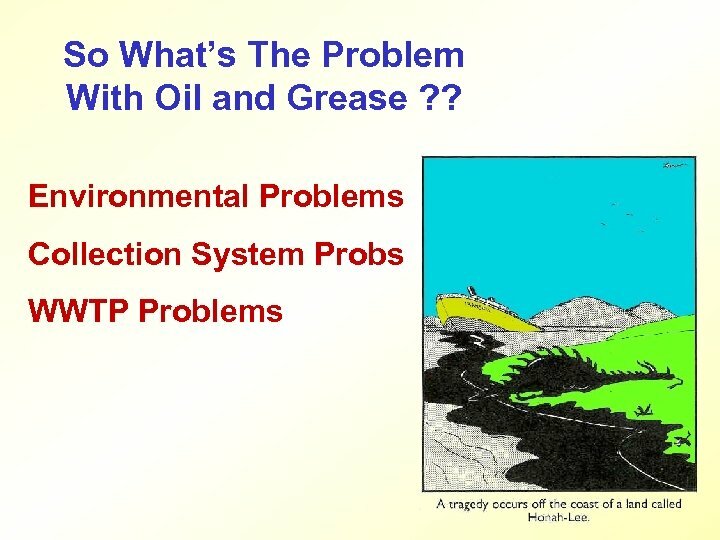 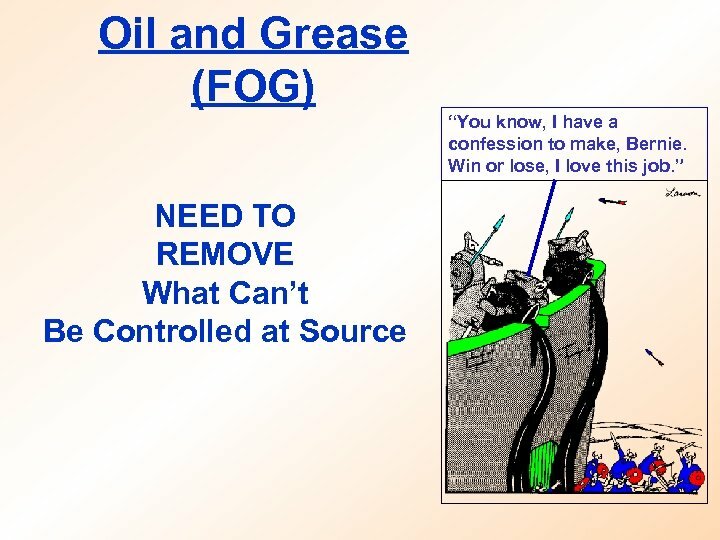 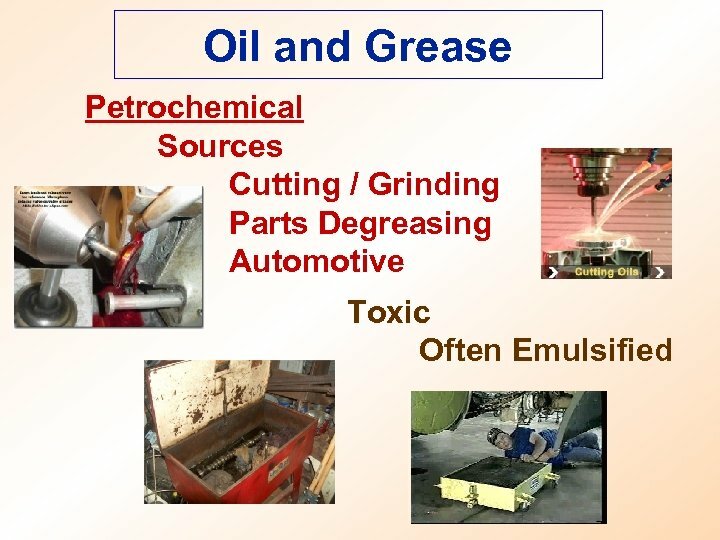 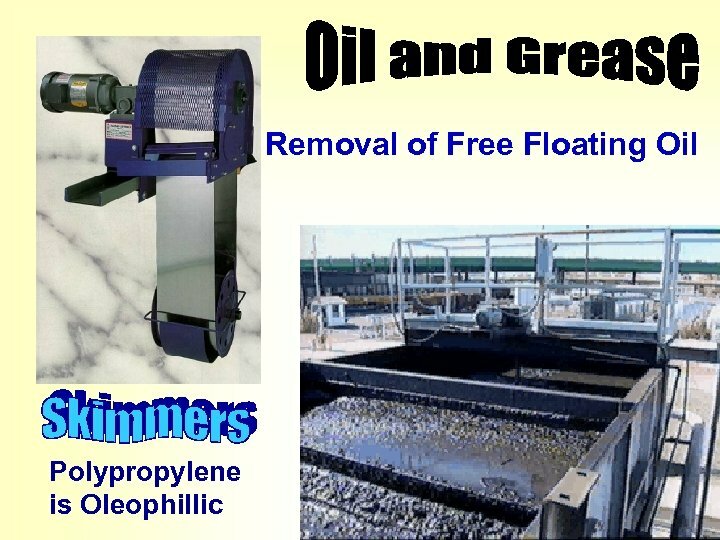 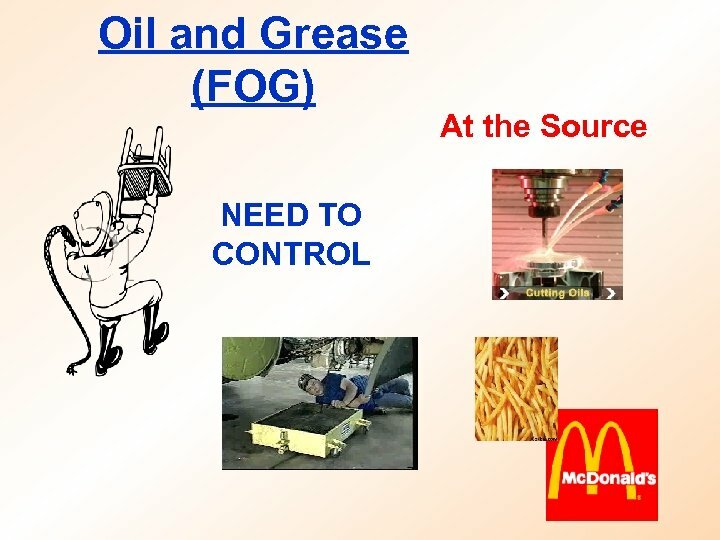 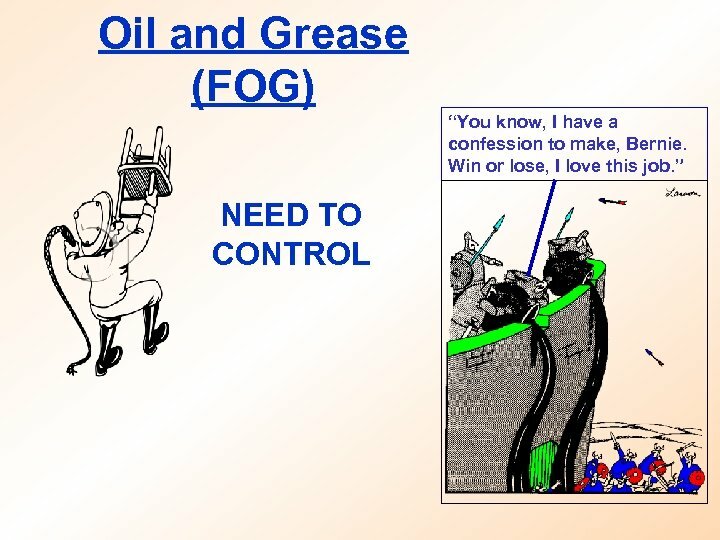 Sludge and oil need to be periodically removed. 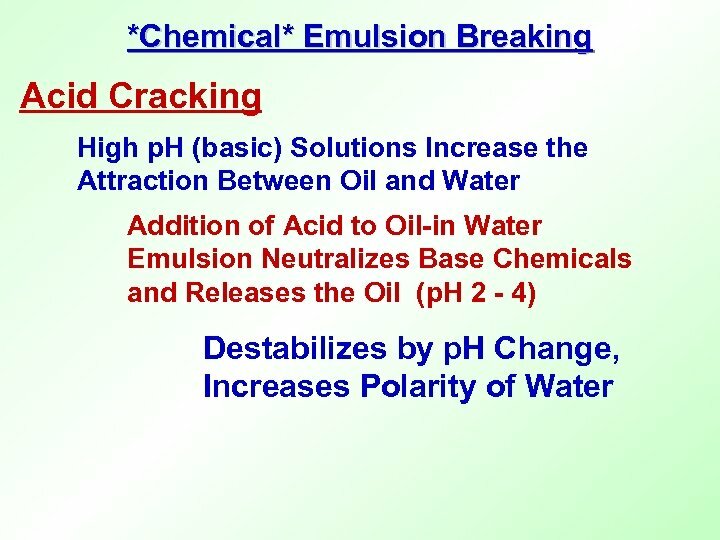 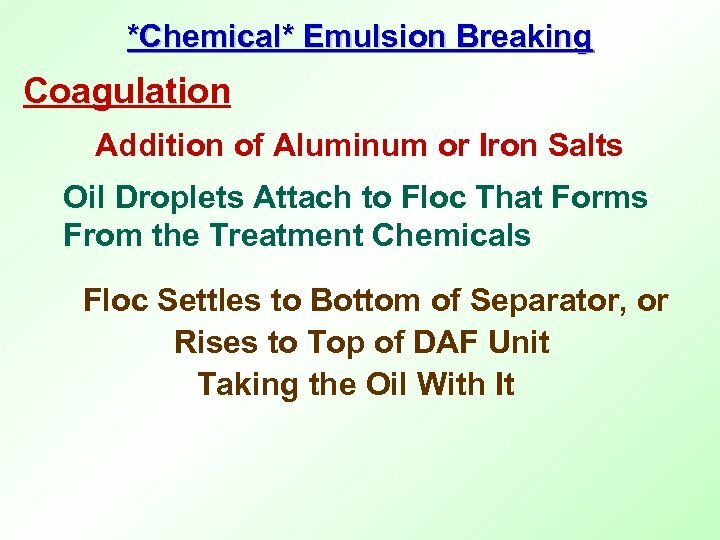 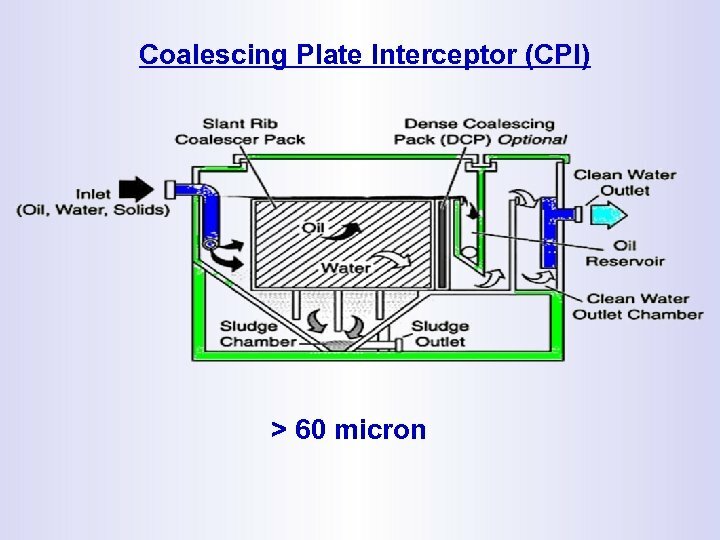 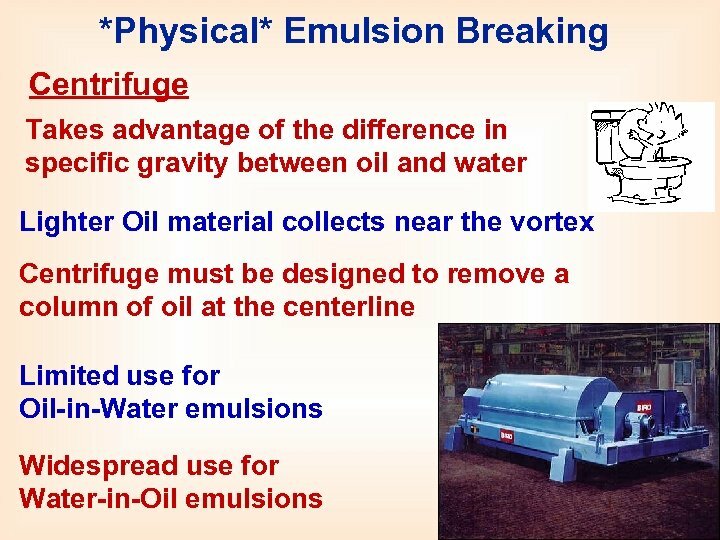 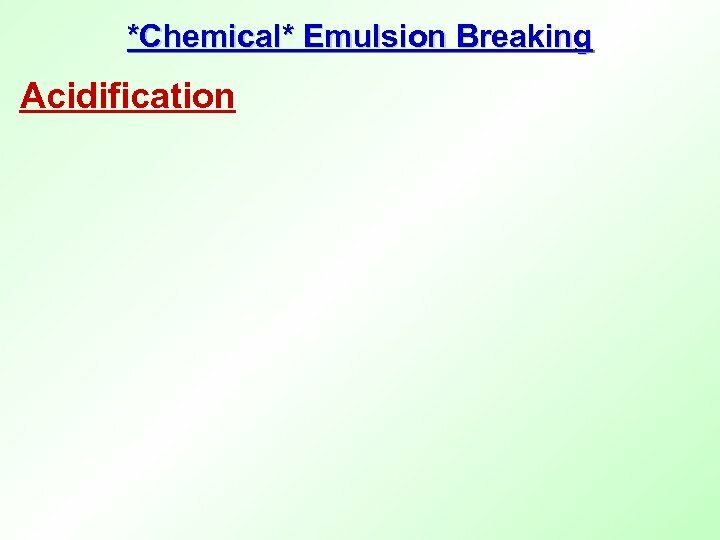 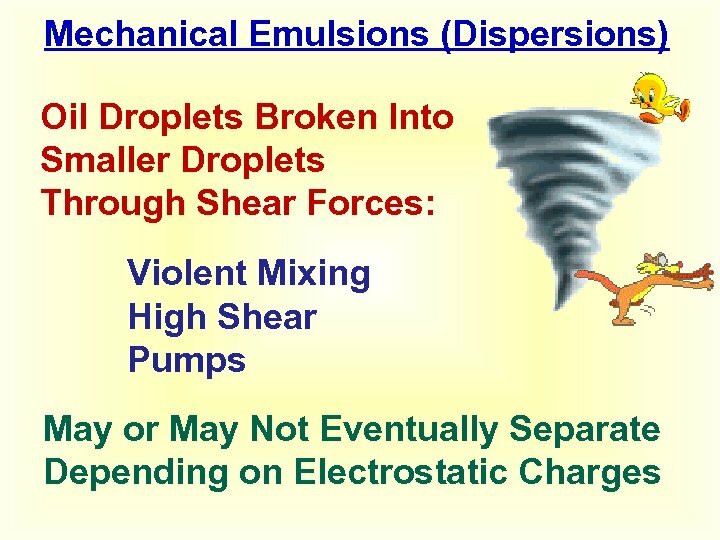 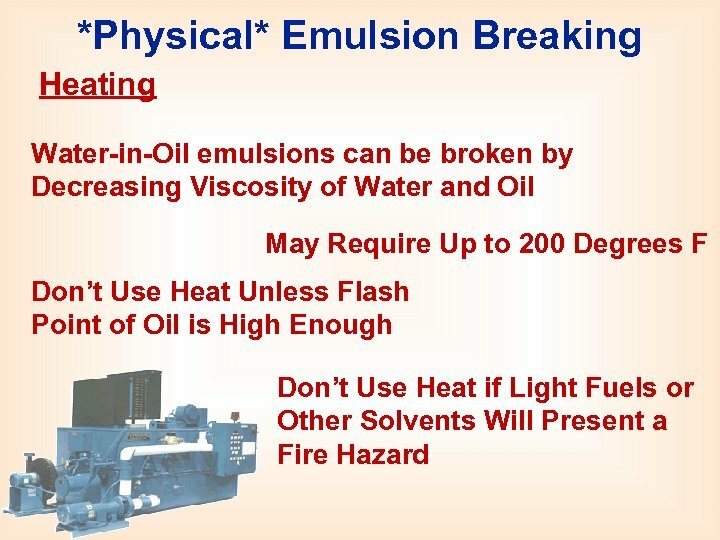 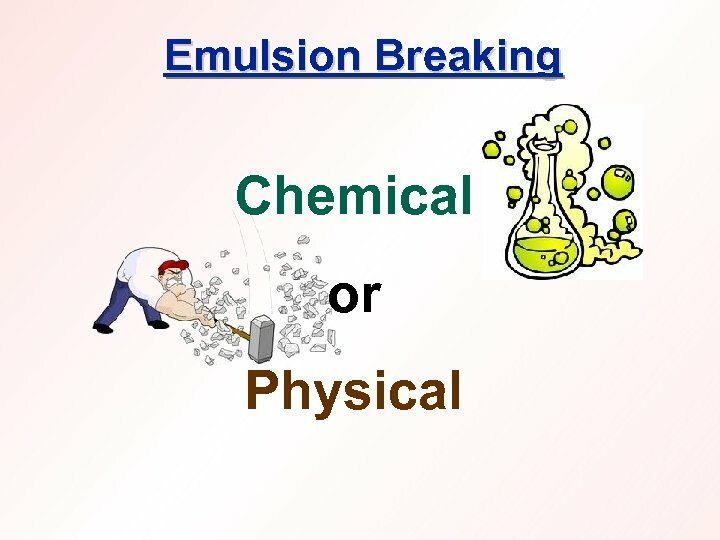 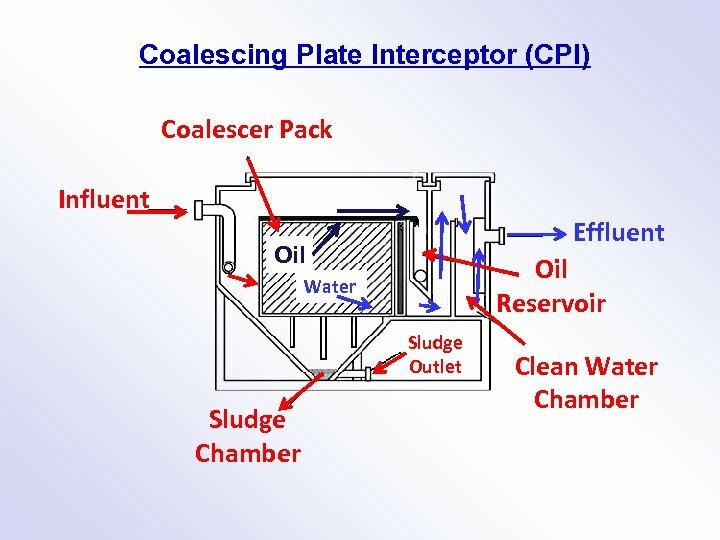 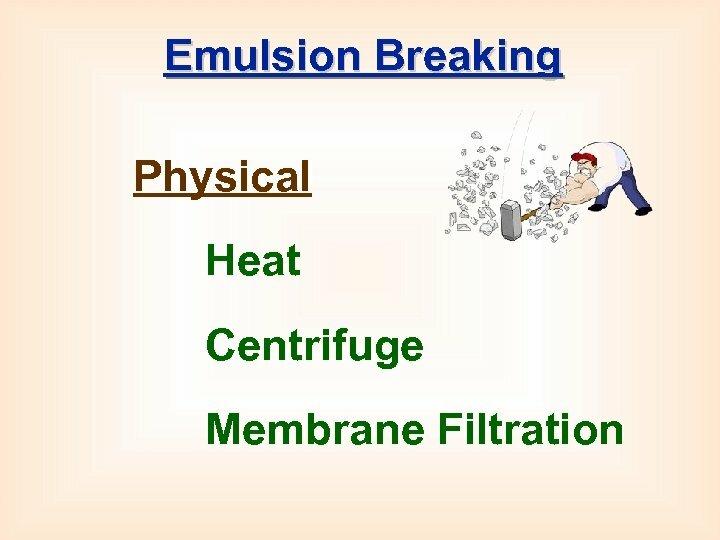 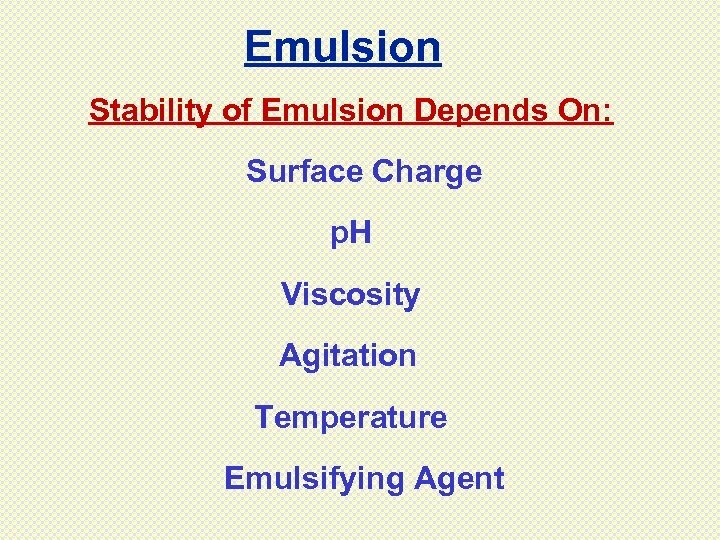 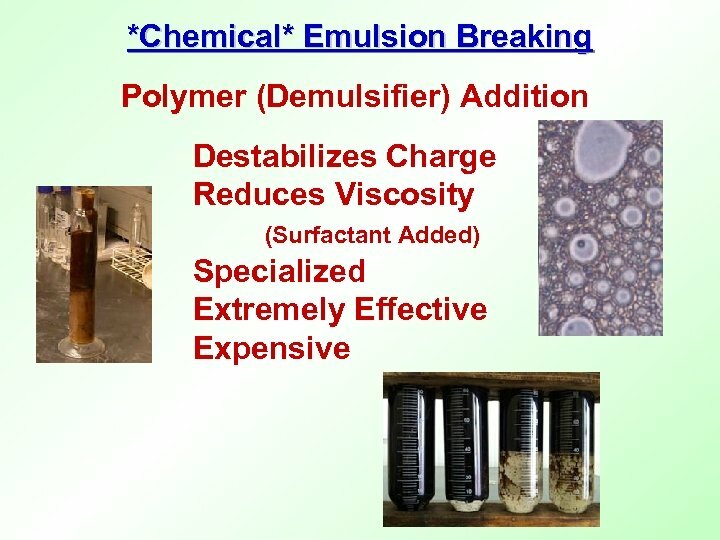 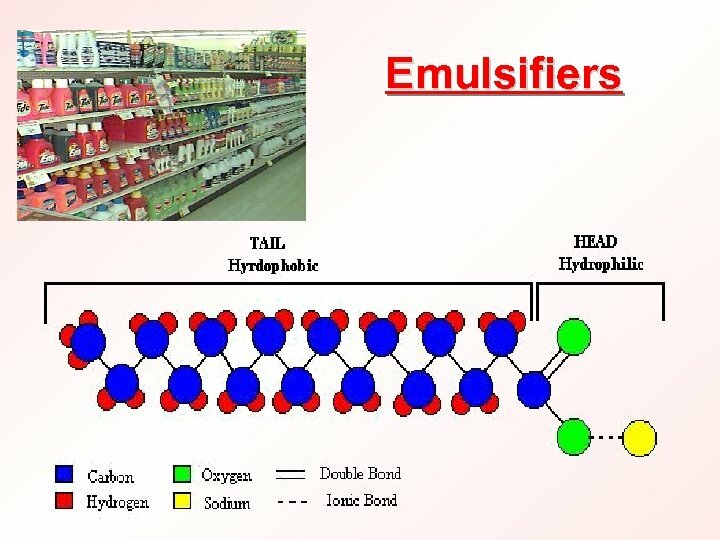 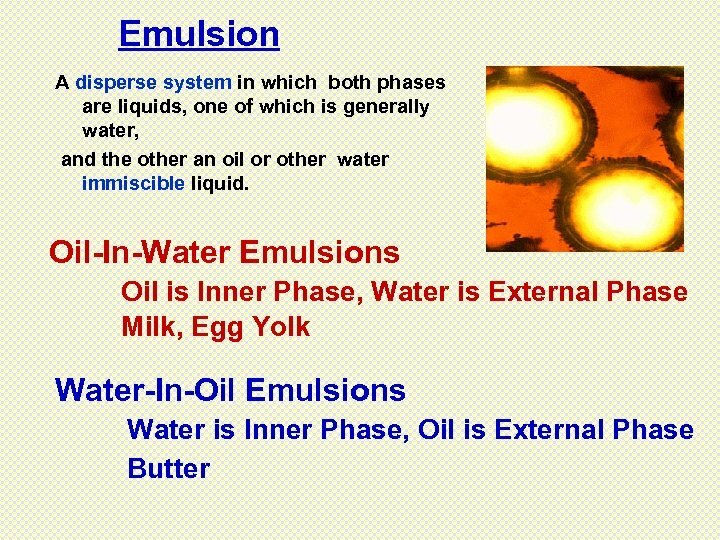 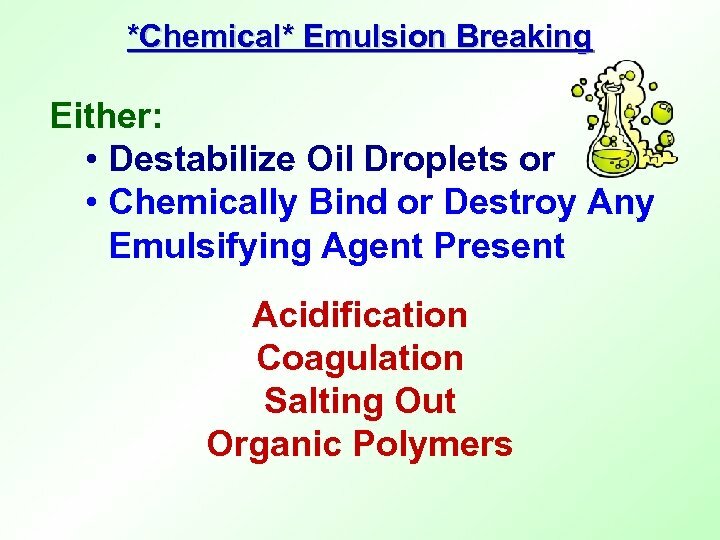 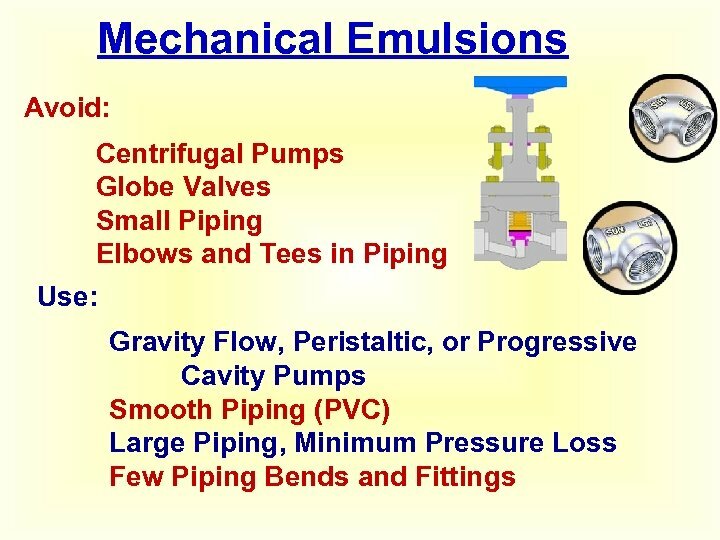 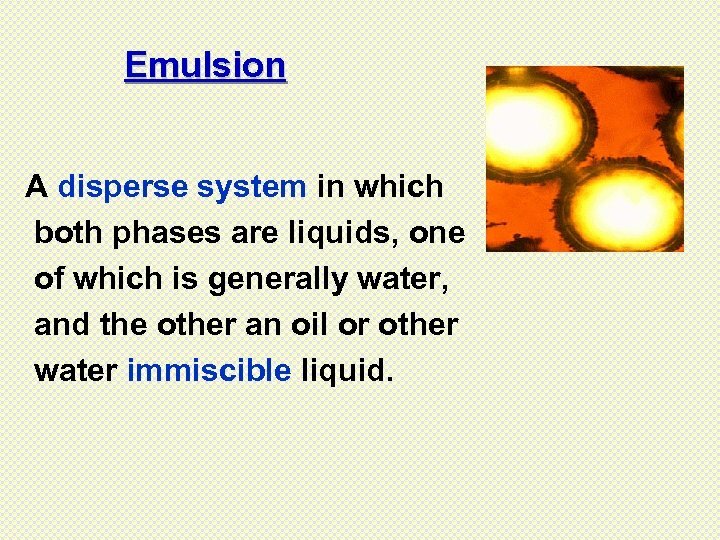 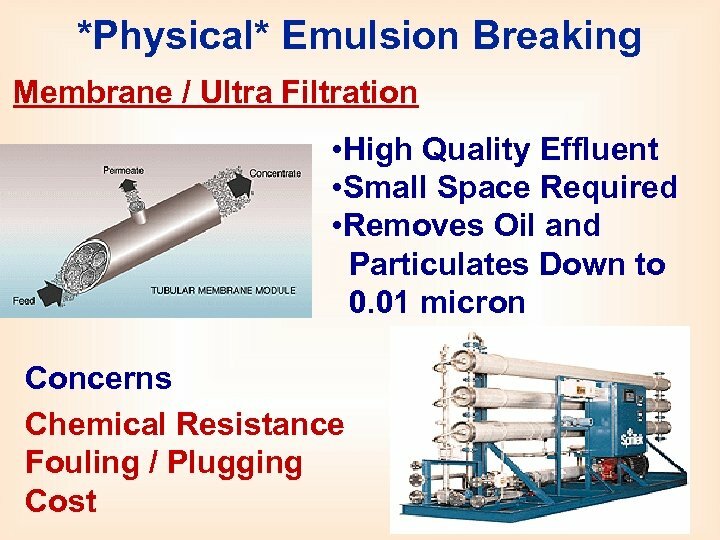 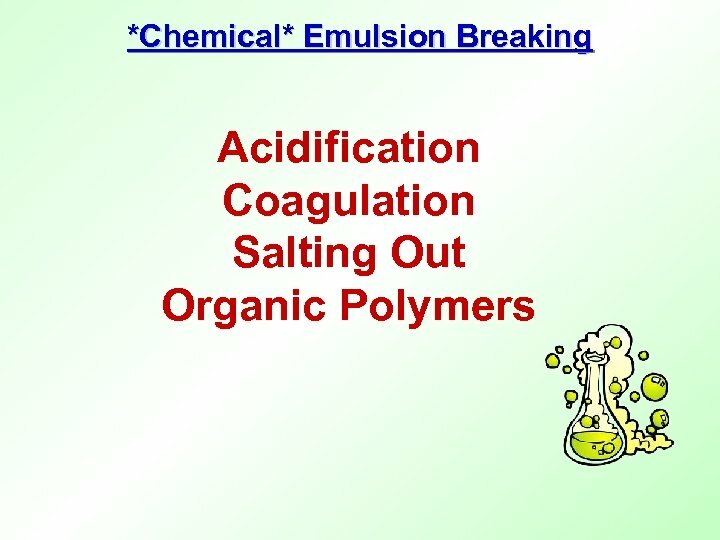 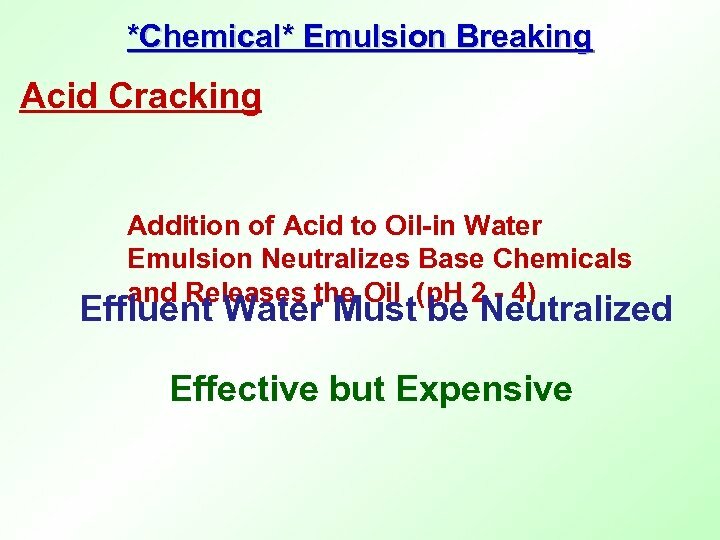 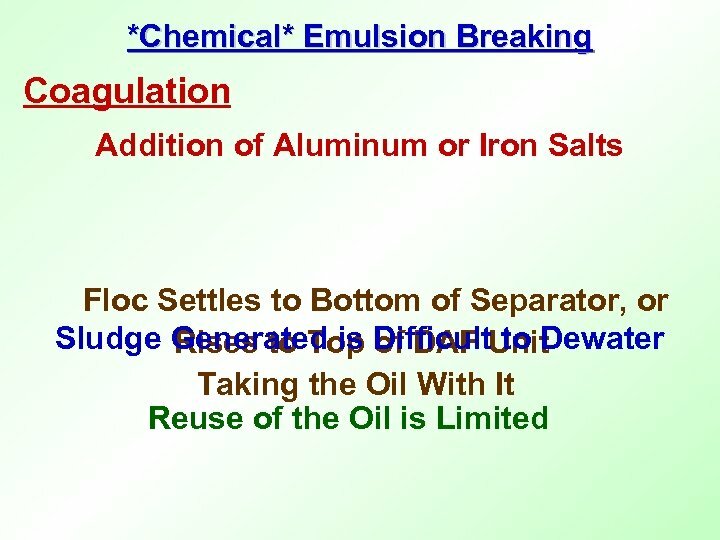 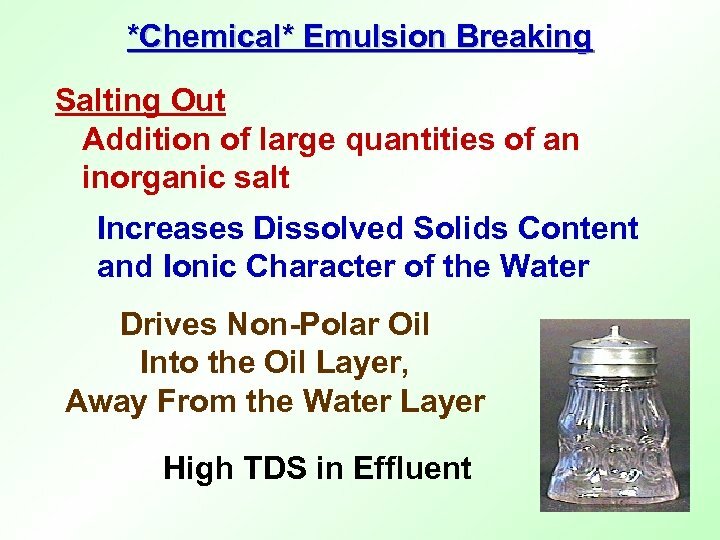 Emulsion A disperse system in which both phases are liquids, one of which is generally water, and the other an oil or other water immiscible liquid. 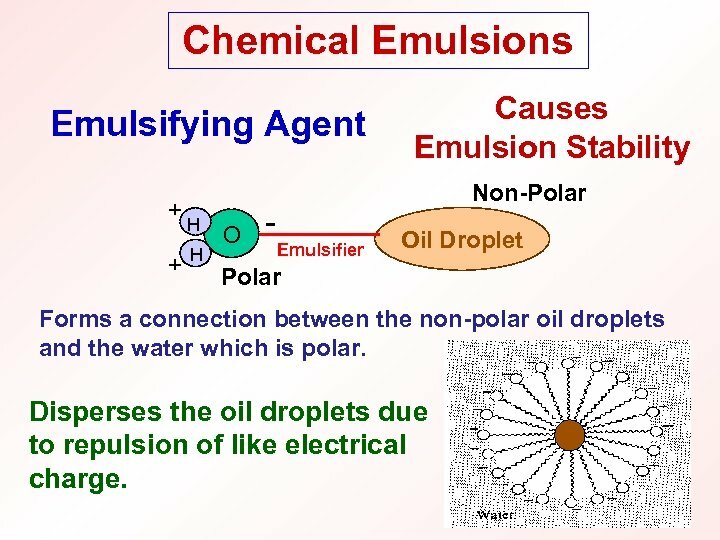 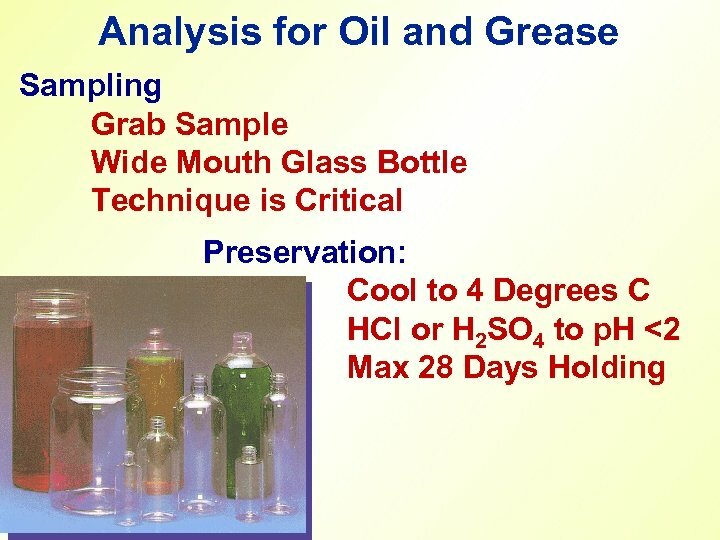 Chemical Emulsions Emulsifying Agent + + H H O Causes Emulsion Stability Non-Polar Emulsifier Oil Droplet Polar Forms a connection between the non-polar oil droplets and the water which is polar. 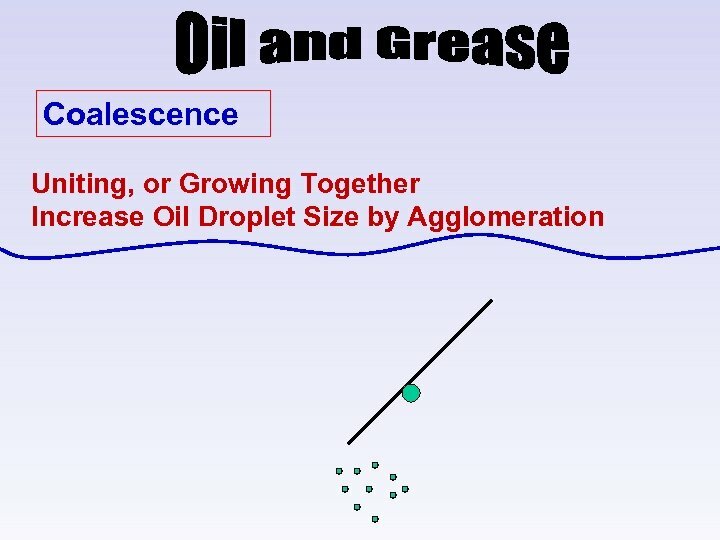 Disperses the oil droplets due to repulsion of like electrical charge.